This print shows the actor lchikawa Danjūrō II in the role of a sword seller for Boys’ Day (on 5 May). He has one foot on his stage partner Miyazaki Jūshirō II. Above, the protagonist’s monologue is written in “grass script”(sōsho). The play seems to use the technique of kakikae – “transposition into a different world”, popular in the theatre of the Edo period. The leaf shows the actor Ichikawa, Danjûrô II (1688-1758) as Araoka Genda (Kajiwara Genda Kagesue) in the role of the sword seller at the Boys’ Festival (shôbu-gatana). He is standing with one foot on the actor Miyazaki, Jûshirô II (1708-1769) in a role which is difficult to identify. The monologue of the sword seller in a dense mass of characters takes up the upper third of the print. Both actors are identified by their mon. They act in the play Honryô Sasaki Kagami (“Mirror of the Sasaki”), which was performed at the Nakamura-za in the 5th month of the year 1727. The play seems to be written using the technique of “mixing different worlds” (kakikae). The original story is part of the body of legends surrounding the civil war in the 12th c.
Genda, son of Kajiwara, Kagetoki, who had left the Taira and sided with Minamoto, had distinguished himself in several scenes. In order to be the first to reach the Taira enemies at the battle of the Uji River, he wanted to be the first to cross a ford which had been sought out by Sasaki-no-Shirô-Takatsuna, who was acquainted with area. But just as he had almost reached the other side of the river, Sasaki, Takatsuna called out that his horse’s saddle-strap had come undone. As Genda was bending over, Takatsuna overtook him and was the first to reach the opposite bank. This episode gave rise to various dramas. 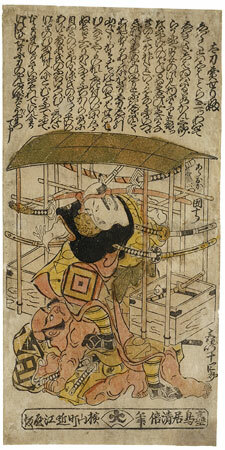 In the play shown here, the rivalry between the two heroes has obviously been transposed into the bourgeois circles of the Edo period, a treatment which other stories have also received. Since the play was performed in the fifth month, it can be assumed that the theme was presented on the occasion of the Boy’s Festival (tango-no-sekku) in this contemporary version. Danjûrô II (1688-1758) was the son of the actor Danjûrô I, who had dominated the theatre around 1700. When the latter was murdered in 1704, Danjûrô II was only sixteen years old. At first he was treated coolly by the theatre and complained that he was given only bad roles to play. But in time, he succeeded in winning the acclaim of the public and his colleagues. Thus he became the most important actor of this time, with a determining influence on the theatre. His interpretation of roles in the Soga dramas was unique in that he liked to make use of the kakikae technique: the transposition of a story from one world to another. The presentation of the Sukeroku story as a transposition of the revenge of the Soga brothers from the 12th c. into the world of the Yoshiwara was his crowning achievement.